Space Skilling Saturday 12 (A new Commander) | Pathfinder XXXI, home of the Sleepyheads. Started a few minutes late, my fault, all were waiting for me while I made some last minute preparations. 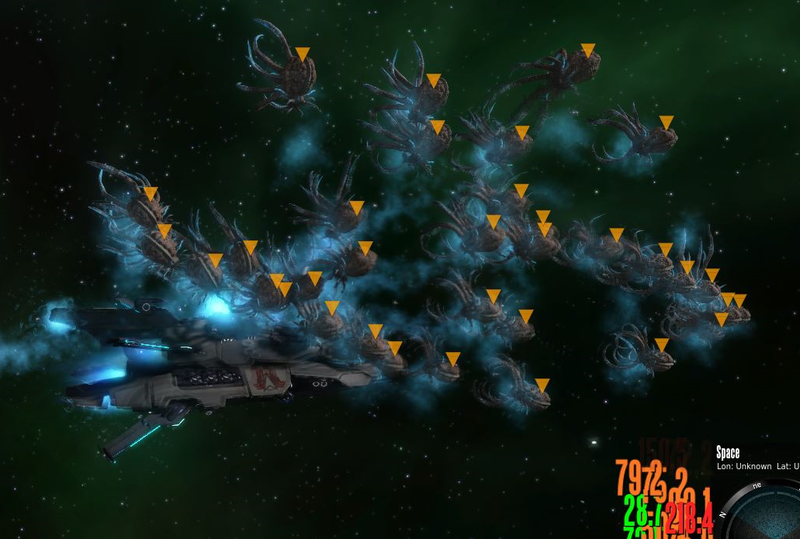 Next in the chair was Nocturaline who also gave us a lot of work and did a few screen shots showing just how many Cosmic Horrors we were up against, one is shown here, fortunately the ship has a reasonable SI so quite a lot of damage can be taken and it survive even when I’m repairing. The chair was offered to Vinge but she declined to concentrate on repair work. I took the last session, pilot and skill gains were good to start with but tailed off, it was only towards the end I realised I needed fresh mobs, dumb I know, I had not even been drinking but had had an exhausting day and was struggling with the whole consciousness thing. After Wolta and Vinge had logged I spoke with Nocturaline about making her a Commander on the ship (Wolta has always held the rank), this means she now has permanent access to the chair and can use the ship as she sees fit providing she brings no disrepute to the vessel and reimburses me for any warp usage. We returned to the Arkadian surface in my quad spotting only one retreating red triangle and free fell into the water at Celeste Harbour. Nocturaline began to look into making warp drives. Something I had done in the past but never amassed all the parts for. Still got a way to go on the current drive so no rush. A good session but we still have capacity for more people especially in repair. Hopefully the advert may draw a few in. This entry was posted on Saturday, April 5th, 2014 at 22:29	and tagged with Arkadia, Cosmic Horror, Damage, Entropia, Entropia Universe, hppodcraft.com, Nocturaline, Pathfinder XXXI, Pilot, Pilot skill, Pirate, Quad-Wing, Repair Skilling, S.I., Space, Structural Integrity, Vinge, Warp Drive, Wolta and posted in Logs. You can follow any responses to this entry through the RSS 2.0 feed.